The turn-out for Krisztina’s paper was excellent and we are hoping for a similar showing for what promises to be a fascinating talk. There was far too much discussed to cover in one post, so I will be coming back to what was discussed over a very intense day and a half, but one of the most interesting discussions resulted from Gary Sheffield’s talk on ‘Jay Winter and the Commemoration of the First World War.’ Following a brief survey of Jay’s work, Gary then looked at the legacy of his theories and the implications for 2014-18. Now, a small disclaimer: Jay supervised my undergraduate thesis and my MPhil and was a huge influence on my decision to pursue an academic career. One of his influences on the study of the First World War has been a concerted effort to bring military and cultural historians of the war together in dialogue, an aim that I hope influences my work. Certainly I do strive to balance my love of social and cultural history with an awareness of the military details that shaped the trends I explore, which is why I am currently going so deeply into the history and organization of the RAMC at the moment. Gary’s main point, however, was that Jay’s idea of the memory boom helps to reemphasize victimhood as central to our understanding of the war, something that, he pointed out, has been picked up on in Cameron’s announcement of national plans for commemoration. The dates chosen are those of battles that are interpreted primarily as defeats, with no mention of the final campaign (the 100 days) which one the Allies the war, a fact which prompted a letter from the Western Front Association to the Independent. (Scroll down). In addition (a point I had not picked up on before), the school visits being funded are to soldiers’ graves, not battlefields which places the emphasis not merely on victimhood but sacrifice. Gary’s point was that children won’t actually be getting a sense of what the war was like by walking the landscape of battle but it also raises the point of whether those who survived the war are to be commemorated. Having worked extensively on the history of disability and the war, I am all too aware of how little is remembered and understood of those who returned to civil society, many wounded in body and mind, and who struggled to reintegrate. The majority succeeded, but not, I would hazard, without significant cost. Their stories are seldom told. It was fascinating to hear a critique of the announced plans from the perspective of military history, and a reminder that military and cultural historians are often trying to tell a similar story, albeit from differing perspectives, and raise similar concerns about the way in which we remember and commemorate the war. The problems that we all, as historians, face in making these concerns public was the subject of an equally interesting presentation by the historian of the South African War, Professor Fransjohan Pretorius, who was involved with the commemorations in South Africa a decade ago. But that talk was itself rich enough that I think I had better return to it in another post. Well, I was supposed to be going to the gym today, and making a start in Special Collections with various histories of the R.A.M.C. which are held there. The gym plan foundered on the fact that I have left my trainers at home. The library plan has gone west due to the fact that I have also left my netbook behind, making note-taking an extremely laborious process, and something of a redundant one as I will, at some point, have to transfer any notes taken on to a computer anyway. I can’t actually say I am sorry to be missing the gym. It is a grim, drizzly Monday and the thought of trudging off in this weather to put my body through half an hour of discomfort does not appeal greatly. The missed library trip is a bit more troublesome. I reached something of a crisis point at the end of last week when I realised that I currently know more about the history of both the Red Cross (British and International) and the St John Ambulance Brigade in the first two decades of the twentieth century than I do about the R.A.M.C. in that period. I do know that, after the debacle in South Africa, there were major reforms, associated with Haldane’s other army reforms, but I definitely need more detail on this if I am to properly understand the place of the R.A.M.C. within the wider military structure. This is vital at the moment as I am struggling to get to grips with the differences between non-combatance and neutrality in relation to the medical services, and the extent to which various medical services were answerable to a national military force as opposed to a wider humanitarian mission. If I am to have any understanding of the role of voluntary services during the war, I need to have a much better understanding of the political position of the army medical services first. Actually, it might not be a bad idea to get a sense of the place of the military as a whole in British society, so if anyone can recommend a good history of the Haldane reforms, please do let me know. In the meantime, lack of portable computing (or at least portable computing with a decent keyboard) means I will be hunkering down in my office with 700 pages on the history of the International Red Cross and a book review to write. There are worse ways to spend a drizzly day, I suppose. I have spent the weekend trying to get to grips with why I feel so uncomfortable about David Cameron’s announcement of £50 million toward the centenary commemorations of the war. On the face of it, all his announcements are self-evidently Good Things – more money for the Imperial War Museum (still one of my favourite archives if only for the irony of reading about war under a burnished 10 Commandments in the reading room that used to be part of the hospital chapel), school visits to the battle fields, additional funding for local history groups, a focus on memory and commemoration. So why am I not embracing this announcement wholeheartedly? I have come to the conclusion that it is mainly due to the steering committee that was announced, filled as it is primarily with former servicemen and politicians. Yes, Hew Strachan is an excellent representative of the community of First World War historians in Britain, and Sebastian Faulks seems a sensible choice to represent the arts, although I am sure there are plenty of others who would be just as appropriate. But they are so far outnumbered by ex-servicemen as to raise the question of what the steering group believes these are commemorations of. Are we going to see commemoration the war as a total war, one that influenced every facet and stratum of society, not just in terms of mourning (as is usually commented on) but also in terms of changing attitudes, new forms of work and service and technological developments? Or are we going to have commemorations limited to the Armed Services? How much of the focus is going to be on this particular conflict and how much on the service and sacrifice of all British (and Imperial/Commonwealth) forces since then? My other source of unease is the fact that no reference at all was made to the work that universities around the country have been doing for several years now and will continue to do for the next six years. Yes, many of these projects come under the aegis of the IWM’s First World War Centenary Partnership but so do many of the Heritage Lottery funded local history projects that get a name-check. I am acutely aware that the Legacies of War project, one which is partnering similar local initiatives, has taken two years of hard work to get off the ground. A similar amount of time has been spent at the University of Newcastle developing an international network of research into children’s experiences of war in the early twentieth century. Birmingham and Kent are both centres of research excellence for First World War studies. And the International Society for First World War Studies, now in its eleventh year, was founded by two academics based in Britain. There is a wealth of passion and expertise to be tapped in our research institutions in this country, equal to that of the local history groups who will, quite rightly, be contributing so much to the commemorations, passion and expertise which Cameron, in his announcement seems to ignore. Hopefully it can be used fully by the Centenary Partnership and those of us who make our living out studying the Great War can demonstrate the leading role that British academics have played and continue to play in the study of the First World War. Time for a bit of promotion of various things that I and my friends and relations have been involved in. First of all, on the academic end of things, I am co-organising a seminar series with a couple of postgraduate students here at Leeds University. 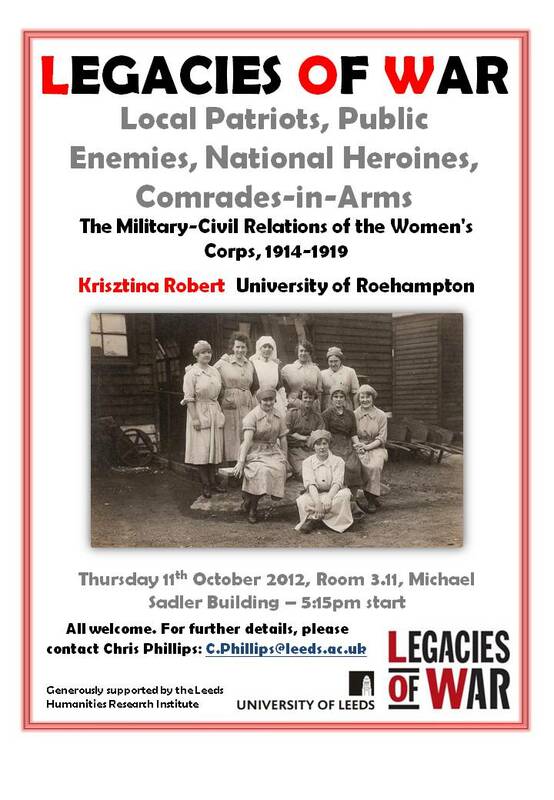 Our first speaker is Krisztina Robert from Roehampton University who will be talking about relations between women’s auxiliary groups and the military. And at the more popular end, and just to prove that historical tendencies do run in families, here is an introduction to the war written by my cousin, Raoul Meyer. It is a bit problematic in its claims about machine guns v. artillery and is very Fussellian in its literary interpretation, which I do take some issue with, but it is very, very good on the global nature of the conflict. Watch and learn. Finally, totally unrelated to the First World War, can I recommend my friend’s blog The Lion, The Witch and the Bookcase? She writes beautifully and inspiringly about children’s literature, a pet obsession of mine. Well worth checking out.